Neck and back pain are two of the most common reasons people seek treatment. 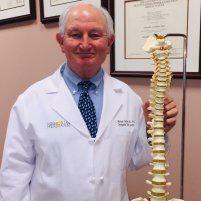 At Northwest Spine Center in The Woodlands, Texas, J. Michael Graham, Ph.D., M.D., is highly skilled in diagnosing the exact cause of your pain, so you can receive the right treatment. Dr. Graham customizes your treatment, which may include physical therapy, injections, or minimally invasive surgery, to help you achieve long-term pain relief. Find out more about treatment options for neck and back pain by calling the office, or book an appointment online today. Neck and back pain may be the result of acute injuries or the natural aging process. As the bones and cartilage of your spine begin wearing down, you may experience aches and pains that impair your function or mobility. In some cases, chronic neck and back pain develop because of overuse, especially if you work in a job that requires repetitive motions. The first thing Dr. Graham does during your initial consultation is diagnose the issue that’s causing your pain. He performs a physical examination of the affected area and may request imaging tests, such as an X-ray or MRI, to get a closer look at the internal structures of the upper or lower spine. Once he has an accurate diagnosis, Dr. Graham creates a treatment plan with a goal to alleviate your pain and increase your mobility and functionality. What treatment options are available for neck and back pain? Treatment plans depend on the cause of your persistent pain. Initially, Dr. Graham may recommend rest and heat or ice therapy to reduce any swelling and help you heal. He may also suggest over-the-counter pain relievers or anti-inflammatory medications to keep you comfortable. Physical therapy can be beneficial for strengthening the muscles that support your cervical and lumbar spine. This type of treatment is often important for regaining your mobility and range of motion. In cases where intense pain in the neck or back affects your quality of life, Dr. Graham may suggest injections to quickly reduce inflammation and numb your pain. If conservative treatments aren’t effective in alleviating your pain or other spine-related symptoms, then you may need surgery. Dr. Graham offers a variety of surgical techniques, including minimally invasive surgery, to ensure long-term relief of neck pain, back pain, or symptoms referable to a pinched nerve. You don’t have to suffer another minute with chronic neck or back pain. Call for a consultation today, or use the online booking feature to learn more about your treatment options.